People have been licking and slurping at snow cones and their myriad of counterparts as far back as around 3,000 B.C. Here in Korea, when summer rolls around, nearly every cafe puts out its own version of the classic, cool treat ― routinely in the form of the native bingsu ― piling gobs of red bean paste over shaved ice. The toppings vary from eye-popping jellies, cornflakes, mounds of ice cream, to more modest combinations of powdered green tea or just, simply, milk. Rarely does a bingsu forgo red bean paste, however, which is why this dessert, more accurately known as “patbingsu” (which means red bean paste ice flakes), is reputed to stem from Japan ― from whence a cold red bean paste dish was introduced during the Japanese colonial period (1910-1945). That does not mean that shaved ice treats were foreign to Korea before the 20th century. Records show that during the Joseon Dynasty (1392-1897), Seobingo ― the government office in charge of the royal ice box ― would share ice with fellow officials, who would enjoy it finely crushed and mixed with fruit for a granita-like dessert. Today, iced-up fruit is far less common than patbingsu. Patbingsu holds a special place in Korean culture, summoning deep stirrings of nostalgia amongst those who can remember the first time they dipped a spoon into that cool marvel of ice, milk and beans. In fact, fond memories of patbingsu’s past draw a loyal set of customers to the old-fashioned Korean bakery: Tae Keuk Dang. Since its opening in Jangchung-dong in 1973, the storied establishment has stuck fast to its original recipes for bingsu and monaka-wafer ice cream sandwiches; never falling prey to the temptation to follow newfangled trends. “The flavor has stayed the same,” said general manager Kwon Ga-myung. Boasting a weathered white front and a huge sign that bears the motto “A Cookie Amongst Cookies,” Tae Keuk Dang invites visitors into the past, greeting them at the entrance with a huge-tiered glass case chock full of breads and pastries. The ice cream and monaka- and sticky rice- wafer sandwiches ― sit in a quaint red-lettered white refrigerator box near the cashier. All you need to do is slide open the glass door on top and dip your hands in for your treat of choice. According to Kwon, the milk for the bakery’s ice cream comes from the Tae Keuk farm in Namyangju, Gyeonggi Province. The resulting creamy confection ― which can be enjoyed plain, as coffee ice cream, or stuffed into a wafer-casing ― is not the rich, sumptuous stuff of today. Mild, barely-there sweet and tasting more of milk than of cream, the best way to describe the unique taste of Tae Keuk Dang’s ice cream is to call it a minimalist expression of the summer dessert. Encased in a monaka-wafer the snowy ice cream plays well against the slightly salty, buttery tasting shell. Plus there is the added fun of eating an ice cream sandwich that looks like a beige-colored Hershey’s chocolate brick. 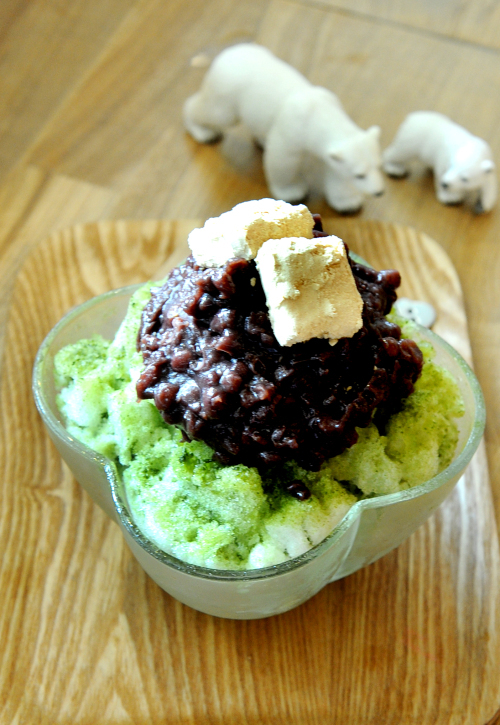 Then there is Tae Keuk Dang’s patbingsu. Bright jellies and fruit cocktail laced with condensed milk tickle the memory with a medley of sugary and creamy flavors. Cornflakes add crunch. Super-soft homemade sticky rice cake nubs add chew. The heart of the dish ― the red bean paste ― is made in-house. Generously heaped over the milk-soaked, shaved ice, the paste maintains the integrity of the bean from texture to taste. Sugar plays second fiddle to the nutty richness of the paste. At Sinsa-dong’s Bari e Malgm ― a white and wood space with a Scandinavian vibe ― the bingsu is pared down to a homier treat, with a flourish here and there. 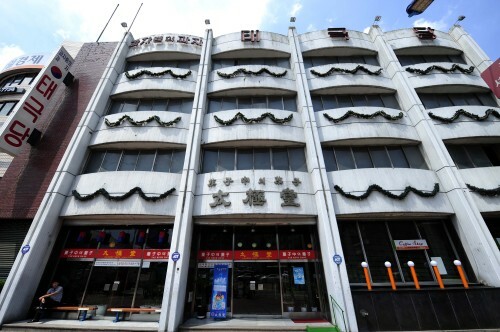 “This is tradition,” said Bari e Malgm president Lee Su-jung, holding up the cafe’s milk bingsu as an example of how the bingsu was done in the past. 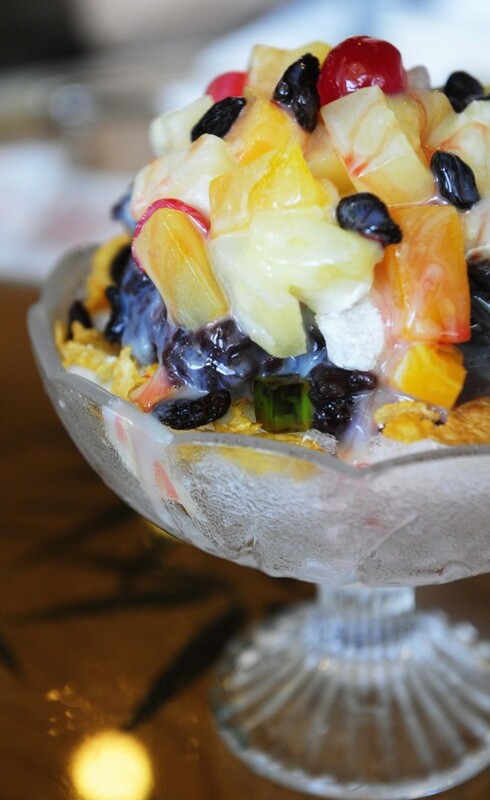 Indeed, for those whose childhoods are filled with memories of hot summers when families would gather together, pull out the home ice shaver, and whip out a simple treat of shaved ice topped with chilled milk and red bean paste, the Bari e Malgm bingsu may feel infinitely closer to home. 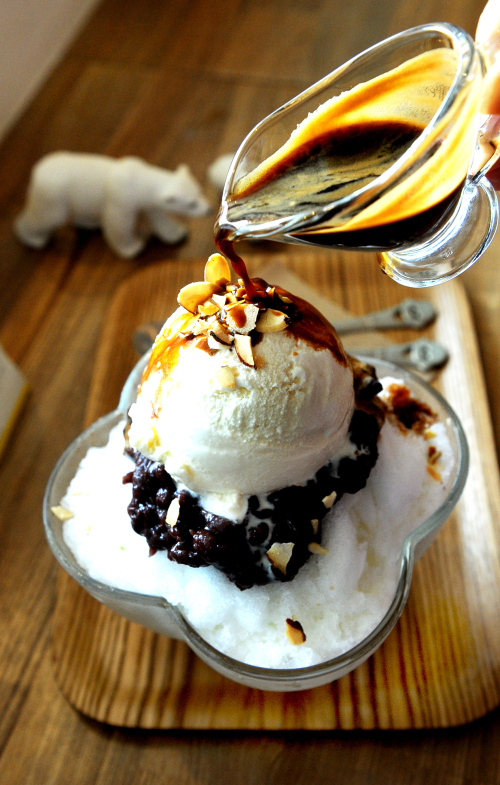 Fresh paste made from domestic red beans serves as the crowning glory for a bingsu that features condensed and regular milk, powder-fine shaved ice and two cubes of sticky rice cake coated in bean flour. Upscale variations include a particularly toothsome affogato-meets-bingsu, where a scoop of vanilla ice cream and a shot of espresso add complexity to the traditional dessert. But not everyone is a fan of red bean paste. Snowmounteen offers a unique and bean-free take on the snow cone. Brought in from Taiwan, the newly-minted parlor’s “snow ices” bring new meaning to the concept of the snow cone. 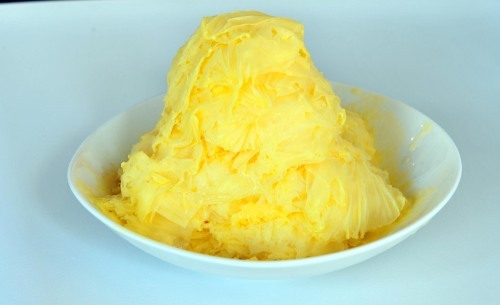 Snowmounteen’s mango “snow ice” achieves its cold, luminous flavor through a shaving machine that turns low calorie ice cream into a fondant-like heap of translucent sheets. Low calorie ice cream is frozen into cylinders and then run through a Japanese ice shaving machine to create translucent, paper-thin layers that stack up quickly to create an oddly fondant-like, slightly chewy and creamy heap of a dessert. Mango tastes like its glossed-over ghost ― cold, luminous but present. The juicy sugar of lychee is amped up by the solid ice cream-shaving process, while coffee walks the line between an iced Americano and an elegant sorbet. “Plans are to open 700 (outlets),” said sales marketing manager Jang Baek-jin. For now this is the only place in Korea where one can sample this dessert. Other options are to fly out to other countries ― Taiwan, Japan and Singapore, to name a few ― that sell it. Open from 8:30 a.m. to 9:30 p.m. on weekdays, and to 10 p.m. on weekends. Sticky rice wafer ice cream sandwiches cost 1,800 won, monaka-wafer ice cream sandwiches 1,200 won, vanilla or coffee ice cream 1,200 won and patbingsu 7,000 won. To get, there go to Dongguk University Subway Station Line 3, Exit 2. For more information call (02) 2279-3154. Open from 11 a.m. to 11 p.m. Bari e Malgm is closed on Sundays. Milk bingsu costs 12,000 won, coffee bingsu 14,000 won and green tea bingsu 14,000 won. To get there, walk down Garosugil, away from the side near Hyundai High School and towards the side near Sinsa Subway Station. Several blocks down, towards the end of Garosugil there is a 7-Eleven convenience store to your left. Turn left and walk up the road till you pass the first intersection. Bari e Malgm will be to your left. For more information call (02) 3444-8241. Open 11 a.m. to 11 p.m. daily. “Snow ice” comes in three different sizes and costs 2,500 won to 6,500 won. To get there, go to Apgujeong Subway Station Line 3, Exit 2. Walk straight toward Galleria Department Store. One block before the department store, turn right, right before you reach Hana Bank. Walk straight till you hit the intersection with Starbucks on it. Take the left fork and walk straight for two blocks. Snowmounteen will be on your left. For more information call (02) 517-0803.